If you’re like me, you’ve scoured the internet for tips on everything from “how do I make my vocals sit better in the mix?” to “what is side-chain compression?” There is so much out there, that the noise sometimes drives you to what we’re all told in the first place: just play with it, and if it sounds good….then it’s right. But tips help get us closer to our goals so that we don’t get frustrated, and can then spend the positive energy on making our material unique instead of just adequate. Recently I found a suite of online tutorials that I think is the best collection of useful, easy to understand, demonstrative tips gathered in one place. 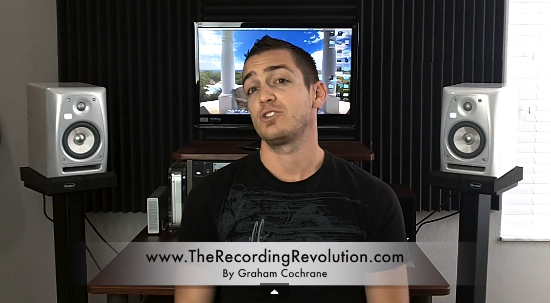 Graham at TheRecordingRevolution.com has put together a series called “5 Minutes To a Better Mix”, where in 31 days he presents 31 different clear tips on how to make your recordings, well….better. At first it was just a personal challenge to offer a new tip each day for 31 days straight. However, the series was so popular that he’s now it 2 more times – each with completely new tips – totaling a staggering 93 of these 5-minute videos that really do a nice job walking you through common questions we all have. Graham is extremely easy to listen to, very clear in his descriptions and instruction, with good real-world examples and audio samples to highlight exactly what he’s talking about. Note that he’s using Pro Tools as his DAW, however his tips are not specific to that DAW. And he tends to use the native plugins that are included in Pro Tools, instead of thousand-dollar add-ons that mostly professionals would have. Refreshing. You have to check out 5 Minutes To a Better Mix if you haven’t stumbled across them already. I’m a huge fan. This entry was posted on August 7, 2013 by davealloway2001 in Recording and tagged Drums, Logic Pro, Mastering, Plugins, Pro Tools, Recording, Tips, Vocals.